My 7 year old daughter's latest passion is knitting She has been knitting all day (it was funny to watch her walking along with her friends today whilst knitting!) 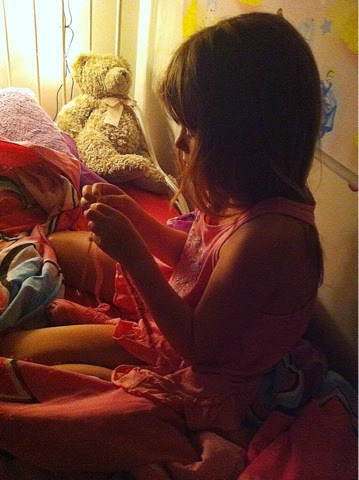 and is still knitting whilst in bed (even when I kissed her goodnight and switched of the light at 8pm - when I went past later the light was on and as I peeked in sure enough she was knitting!) It highlighted for me yet again the motivation to keep going a child can have when it is something they want to learn rather than what we want them to learn (incidentally she tried to teach me and I was not interested at all and so just could not pick it up - lesson learned again - what is of interest to one may not be to another and that is ok!